Normally I don’t go for an incremental update on any of my gear, whether it was phones, computers, consoles, etc. However when my parents wanted to “buy” my camera from me, I decided instead of just getting another D7000, I’d go ahead and try out the updated D71000. DISCLAIMER: This is an informal review. I am not a professional photographer but instead an enthusiast. It is also my opinion that there is nothing that beats actually getting your hands on the camera in question. Also, I am coming at this as a cosplay photographer so keep that in mind when I go over what I like and don’t like. The D7100. Now with improved weather sealing (shown in yellow). now with built-in stereo mic. allows for Wi-Fi connectivity between camera and other Wi-Fi enabled tablets and smart phones. Rear button layout. Note the reversal of the Zoom In and Out buttons as well as the placement of the Live-view switch. 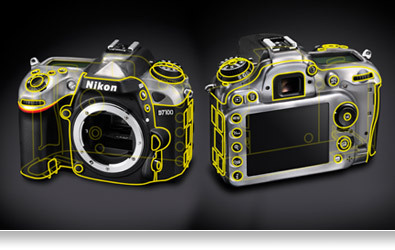 Most of the the features and ergonomics are similar to the D7000. The only changes to the controls are that the zoom in/out buttons (during photo reviews) are swapped and the live-view switch was moved and now has a photo-mode and a video-mode. There is a short learning curve for those just coming from the D7000. However the changes that don’t need much thinking is the button-safety for the Mode Dial, preventing accidental changes in shoot settings. Must of the improvement is under the hood with better moisture and dust resistance, a newer AF algorithm that is not only has more points but also can handle up to -2EV (darker) conditions. There was also an update on the video aspects with higher resolutions and bitrates for video recording and a built-in stereo mic as well as having HDMI output as well as 35mm output and input jacks. However, unlike other cameras like from Canon, the Live View refuses to allow the user to adjust the aperture on the fly (meaning that you still have to switch off the Live View in order to change the aperture). Also, while the AF works well, on Live View, sometimes the AF will loose track of the person and would cycle to both extremes before either locking back on or giving up. Still, the AF algorithm still works fine in normal lighting conditions and is only a factor in lower lighting. With Live View off, the AF is very snappy and accurate. Optical Low Pass Filter removal on the sensor. The Optical Low Pass Filter (OLPF) is a type of Anti-aliasing filter. In digital signal processing, analog (real world) signals are turned into digital (0’s and 1’s) and then back again. To save space on memory, analog signals are sampled at a pre-determined rate to get as much needed information as possible. Later on, this stored digital signal would then be outputted back into an analog signal using a sampling rate requested. In theory, this would reconstruct the signal, such as an image taken by a digital camera. The term Aliasing refers to when the sampling rate fails to capture enough data to the requested output, creating “gaps” where no data exists. In terms of digital photography, this would most affect colors in the final photo. Because of the lower resolution of digital cameras back then (the lower number of samples) there was a high possibility of color errors in the final file without. This is called “Moire” and this happens with complex color patterns like a close up of a pair of jeans, paintings, etc. OLPFs would prevent that, though at a cost to the general sharpness of the final image, raw or jpeg file formats. However, with higher-resolution sensors getting cheaper and introduced into the latest generation of budget-friendly cameras, designers experimented with removing them on higher-resolution cameras, such as the Nikon D800E full frame camera as well as the D7100. I can definitely say that there is a marked improvement in the sharpness for images up to the higher ISO settings (up to 1600, then somewhere between that and 3200, the sharpness takes a dive due to sensor sensitivity). As for the Moire that was supposed to happen with the removal of the OLPF, I did not notice any when I blow up the photos to 1:1 scale on my screen, though I’ll keep my eye out for it. So far, the increase in sharpness is a welcome bonus. Crop Mode for Crop Sensor? Hopefully those of you reading know that, as a Crop Camera (Nikon DX series), that this camera already has a crop factor (1.5x, meaning a 35mm focal length is effectively 50mm). However, the D7100 has a rather interesting feature called “Crop Mode” that puts an additional 1.3x crop factor to the existing 1.5x crop factor. So that same 35mm focal length goes from 50mm to about 69 mm effective zoom length. Though in addition to the increased zoom thanks to the 1.95x – 2x crop factor, the resolution of the final image drops from 24.1 MegaPixels to 15.4 MegaPixels and increases the number of shots on RAW mode from 6 fps to 7 fps. Still not great, but definitely more manageable. And according to the manual, this also increases allows for full HD recording (up to 60i rather than 24p). Again, this is useful for either adding that extra zoom-length to an image or to increase the number of shots continuously. The decrease in resolution only really matters for those who need that extra detail per shot (say for cropping) or for actual large-resolution images (say for printing posters?). In terms of image quality, I’ve only seen a reduction in the dimensions (length and width) due to using crop mode. Of course, you can’t have one without the other so either you leave this off and get only 6 fps continuous on RA, higher resolution, and normal crop factor or the 7 fps RAW continuous shooting, reduced resolution, and the increased crop factor. I loved the D7000 and I would’ve probably kept using it despite the lower resolution, lack of crop mode, and a few modern touches like the unmentioned optional Wi-Fi adapter (I had not purchased or tested this feature out at the time of this writing and probably never will). That camera was one of the most top of the line Crop Sensor cameras on the market and the only real way to do better in specs was to get a Full Frame camera (and even then, it still beats some of the entry-level Full Frames like the D600 series). The new updates brought to the D7100 helped to fix some of the annoyances I’ve had with the D7000 like the mode dial being easily shifted or the placement of the Live View button. Is the D7100 a worthy successor to the D7000? Yes. The increased resolution and sharpness due to the removal of the OLPF brought some mixed results in that now I have a “smaller” buffer to work with. It doesn’t affect me too much as I usually prefer to shoot single-shots anyways, though for those jump shots or high motion shots, I’ll have to be more careful. Honestly, the D7000 could only be pushed up to about 9 shots continuously so it’s not too much of a change and if I needed a lot more, I would have used JPEG anyways. The JPEG performance is still great on this camera. The minor features like Crop Mode and an optional module slot are nice to have. And the improvements to the video recording does help those who want to get video but don’t want a Canon. The camera is priced almost exactly the same as the original D7000, though now the complete kit comes with a single 18-140mm f3.5-5.6 kit lens, which is great for anyone just starting and wants to only have one lens for most zoom lengths. If you’re thinking about going from the D7000, it really comes down to the sharpness vs. cost. Like most device upgrades, it’s a marginal upgrade, though I do think it is well worth it. This is going to be as close to Full Frame performance as one could get for the $1000 body-only price tag. Remember, you could either get a Full Frame with a basic kit lens or the D7000 and now the D7100 and a high-quality lens. Personally, it’s going to be Glass vs. Camera body any day, and and the D7100 is a good body to have. ~ by BlizzardTerrak on September 29, 2014.